Run into any of these unsavory characters out in the brush and you're just asking for an itch or a nasty scratch. 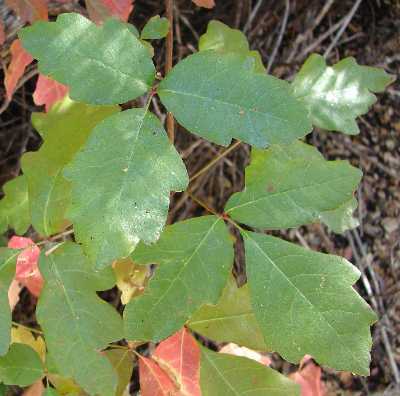 Western Poison-oak or Pacific Poison-oak is found only on the Pacific Coast of the United States and of Canada. It is extremely common in that region, where it is the predominant species of the genus. The plant is often found in oak woodlands and Douglas-fir forests. It can also be found in damp, shady areas near running water and out of direct sunlight. Any trail leading to a waterfall will most likely be home to western poison-oak. 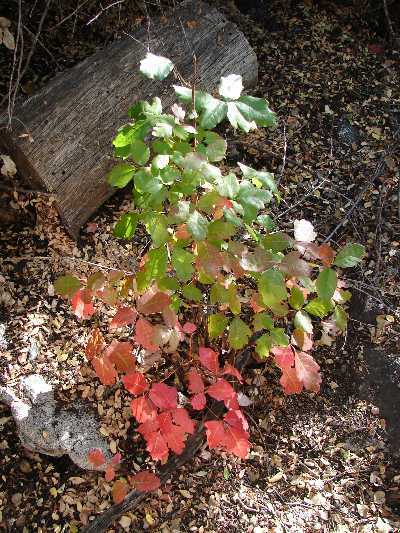 Western Poison-oak leaves and twigs have a surface oil, urushiol, that is an allergenic irritant. Leaves that have three - Let them be! 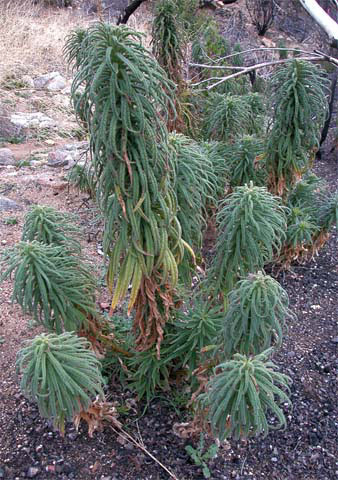 After a wildfire, the dry ridges of Southern California may be invaded by the quaintly named poodledog bush. But all charm ends here, for the sticky and strong-scented poodledog is covered with stiff microscopic hairs that deliver a noxious punch. These glandular hairs, known as trichomes, discourage herbivores and plague passing hikers who brush up against the foliage. The chemicals — prenylated phenolics — emitted by the hairs cause dermatitis and an inflammation similar to that caused by poison oak. The scientific name Turricula means "little tower" in reference to the stalk of deep blue flowers that rises over the plant in the spring. Key characteristics: This stout and densely leafed plant can form thickets growing nearly 10 feet tall. The long linear leaves may be rolled under along their margins.